April 13, 2019 – Raymond goes way back with UFO joining in 1976 and first appeared on the band highest charting album in the U.S. “Lights Out.” from May of 1977 which peaked at #23 on the Billboard album chart. He was also on “Obsession” the following year, the live album, “Strangers in the Night’ in 1979, “No Place to Run” from 1980. He then left to join another parting member of UFO Michael Schenker for his new band simply title the Michael Schenker group. We will have our new interview with Schenker this week on our channel. 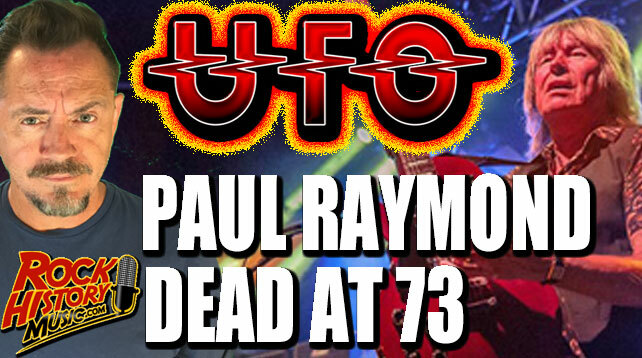 Raymond was in UFO four different times. He’d been with them this last time since 2003. Raymond had just played his last UK show with UFO a handful of days ago. The group was winding down after singer and co-founder Phil Mogg announced his retirement. Raymond’s partner announced his death on Facebook. She wrote, “With a desperate and broken heart, fully in tears and pains that feel like they will kill me I have to tell you that my most beautiful and beloved darling Paul Raymond has passed away today. When Christine McVie left the band Chicken Shack to join Fleetwood Mac it was Paul Raymon who replaced her in that band. UFO was not completely done the band planned had European festival dates for June and July and a final US tour starting in October.